I need some cleaning done on mine. Oooh, Crisis Core, I have it, it's excellent. Of course, my complaint is the general one; too many bloody missions... =.= Thing is, they give so good stuff... You can decimate the final boss with accessories that increase your Magic and Brutal (Break Damage Limit) and then cast Flare/Ultima. Over and over again. Oh, and the extremely broken Costly Punch. See those colorful lines on the right? It started when I bought a new display card since the old one went KABOOM! Every 3 days, a new line appears... I'm afraid that by the end of the year, the ENTIRE right part of the screen will be full of those lines and I won't be able to see nothin'. Any ideas? EDIT: What the hell? You can't see the lines? But it's right there in my screen... So, my monitor? Oh and I left it as a url it because its too F'ing big. My background is a little frightening and strange. You have been warned. If you were from, where I was from, you'd be dead. If you were from, where I was from, you'd be freakin' dead. Eh, not that special, but I like it. I picked up the wallpaper as soon as I saw it. My god cat, that's a hell of a lot of stuff. and lol steamstats. Here is mine. There in only the Emperor and He is our Sword and Shield. I use 2 20' Acer LCDs so the second monitor just extends the overall picture. This is a closer shot of the main monitor. 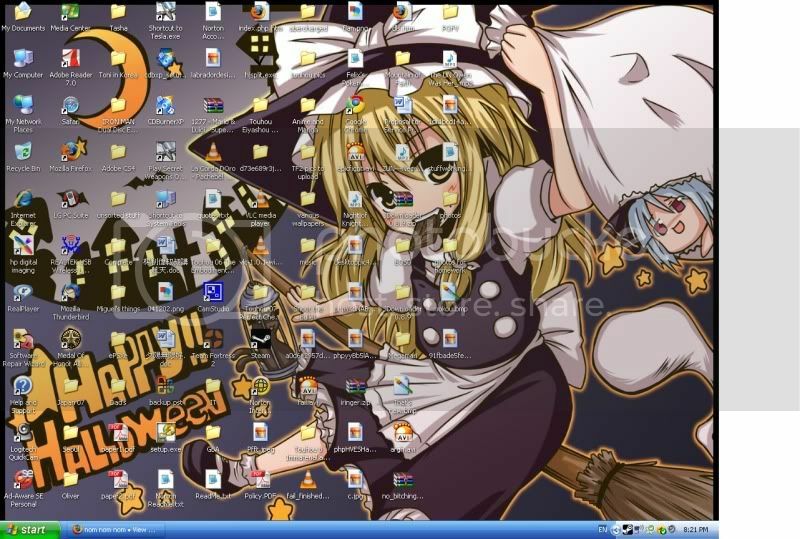 >:C My desktop will never conform to your rigid standards! NEVER! I don't post a lot! This is my main PC. I try to keep it focused on gaming and batch processing. My other desktops are way more cluttered.